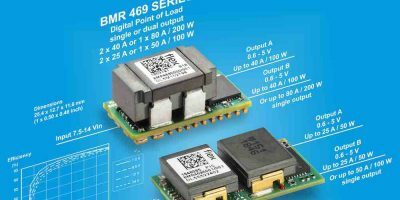 Designed for high current ICT applications, the BMR469 family of digital point of load (PoL) regulators has been introduced by Flex Power Modules. The BMR469 delivers high power density, up to 160A per square inch, to save valuable board space in space constrained designs. There are two variants with different output currents. The 80A BMR4690000 measures 25.4 x 12.7 x 11.6mm (1.00 x 0.50 x 0.46-inch) and the 50A BMR4696001 has a low profile with a maximum height of 5.8mm (0.23-inch). This model can be used where designers need to find space for a large processor heatsink, or who want to place the PoL regulator on the underside of the PCB. The low height of the BMR4696001 also makes it possible to place it very close to the processor, thus improving transient response, says Flex Power Modules. 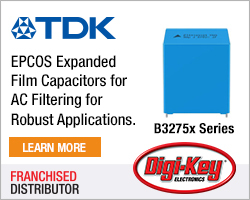 Both versions are configurable as either dual outputs or a single, higher-power output. 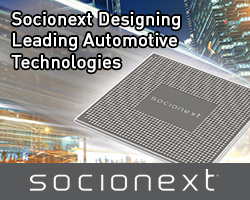 Designers can use one part to cover different requirements, for example to drive different processors or FPGA rails, which helps simplify power system design, adds Flex. The BMR4690000 variant provides two independent 40A outputs for dual configurations, or one 80A rail in single-output operation mode. The BMR4696001 provides two 25A outputs or one 50A rail in single-output operation mode. Up to four modules can be paralleled for current sharing, delivering a total of up to 320A for the BMR4690000 and 200A for the BMR4696001. The BMR469 can be configured via pin-strap or PMBus, according to the application. The regulator is also supported by a simulation model in Flex’s Power Designer software, for design and debug. Using Flex Power Designer’s advanced simulation functions, designers can optimise configuration parameters to achieve a stable control loop with fast load transient responses. The BMR469 is suitable for a range of applications in the ICT market and designs that require high power density and a digital architecture, such as test equipment or simulator manufacturers. 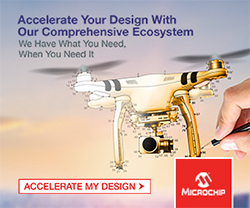 The BMR469 is capable of providing sufficient power to drive components such as processors, FPGAs and ASICs. Efficiency is typically 92.6 per cent at half load (12Vin, 5Vout). The input voltage range is 7.5 to 14V, and output range is 0.6 to 5.0V. The BMR469 meets safety requirements according to IEC/EN/UL 62368-1, and offers a mean time between failures (MTBF) of 18.49 million hours.